Copyright Shiraho Sakana Waku Umi Conservation Society All Rights Reserved. The Coca-Cola Educational & Environmental Foundation, which promotes environmental education and provides a scholarship for young people, announced the winners of the twentieth Coca-Cola Environmental Education Award on August 12, 2013. The Shiraho Sakana Waku Umi (Sea-Rich-in-Fish) Conservation Society in Ishigaki, Okinawa Prefecture, which conducted a hands-on experience on Shiraho coral reef, and environmental conservation activities for the coral reef, won the Best Environmental Activity Award. Hokkaido Sapporo Asahigaoka High School Biology Club in Sapporo, Hokkaido Prefecture, which successfully demonstrated that dragonflies inhabiting the Ishikari wetland can serve as a biodiversity indicator, received the Best Next-Generation Environmental Initiative Award. 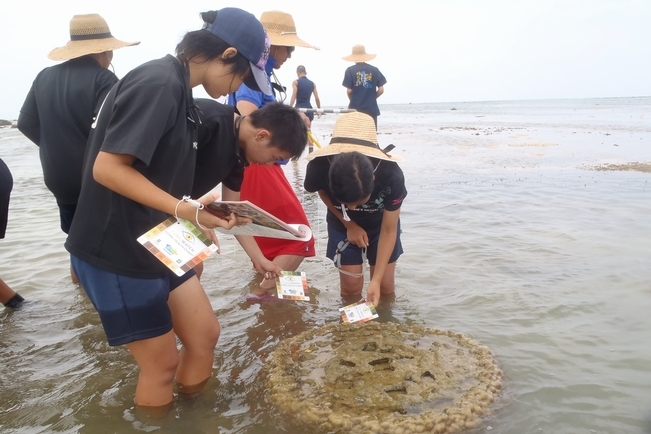 Treating the local coral reef as their ancestral inheritance, the Shiraho Sakana Waku Umi Conservation Society is providing elementary and junior high school students, who will be responsible for the next generation, with a hands-on experience on the coral reef, and conducting environmental conservation activities for the coral reef in cooperation with schools, local residents, an environmental organization and the local government. This award validates the Society's efforts in making connections in the local community, and in preserving nature, culture and regionality for the future. Hokkaido Sapporo Asahigaoka High School Biology Club proposed that the inhabiting of dragonflies be used as an indicator of biodiversity in wetlands, aiming to regenerate the Ishikari wetland. This award is a validation of the scientific analysis and proof of the relationship between dragonflies inhabiting a wetland and the biodiversity of that wetland, and the relationship's potential as a regional indicator.